Color(s): Black, white, gray, apricot. The Maltipoo is a crossing of two breeds: Maltese and Poodle. They are often referred to as a "designer dog" and have become popular companions and therapy dogs. Ideally, the Maltipoo is well-proportioned, sporty, and displays a cheerful and lively expression. They are active, agile, and alert. The Maltipoo is affectionate, loyal, and loving. They do best in homes with older, considerate children. They generally do well with dogs, cats, and other household pets. A sweet and friendly pet, Maltipoo's do not make good watchdogs. The Maltipoo requires daily brushing if the coat is long. Professional clipping is required if the coat is curly. Bathing should be done when necessary using a mild shampoo. They are prone to such health issues as eye and skin disorders. 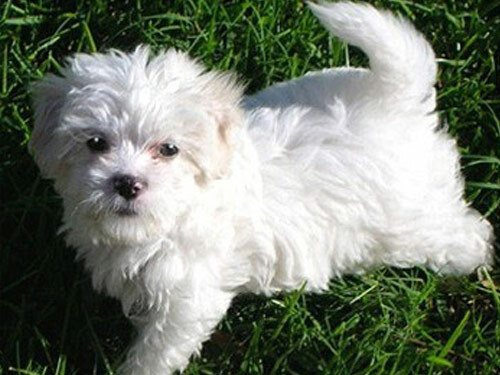 The coat of the Maltipoo may be long, straight, slightly wavy, or curly. The Maltipoo may have a tendency to be stubborn. However, they are intelligent and eager to please their master. They will not respond to harsh or heavy-handed methods. Training must be done with reward, firmness, fairness, patience, and consistency. The Maltipoo is well suited for apartment and city living. They thrive on human interaction and enjoy securely leashed walks and off-lead play time in a securely fenced yard.